Research Highlights in Technology and Teacher Education 2015 . Published 2015 . ISBN 978-1-9397-9719-3 Publisher: Society for Information Technology & Teacher Education. 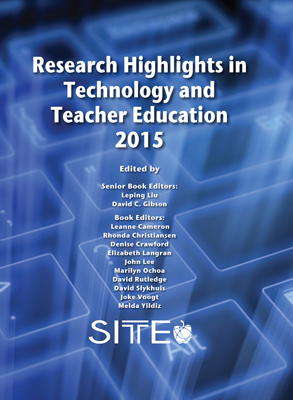 SITE is proud to present the 2015 Research Highlights in Technology and Teacher Education. This compilation represents some of the finest research presented at the 2015 SITE conference in Las Vegas, NV. Each article underwent two rounds of rigorous peer-review so the scholars featured in this book should be as proud of their accomplishments as we are to feature their work. SITE is a broad-based organization of scholars from a wide variety of disciplines who are interested in the role of technology in teacher education. This book represents this wide range of interests so we trust that any SITE member will be able to find an article related to their research interests. At the same time, one of the best things about SITE is the opportunity to learn about research and innovation in areas outside of one’s own specialization and to think creatively about the broader applications of technology. Liu, L. & Gibson, D.C. (Eds.). (2015). Research Highlights in Technology and Teacher Education 2015 . Society for Information Technology & Teacher Education. Retrieved April 22, 2019 from https://www.learntechlib.org/primary/p/151871/.